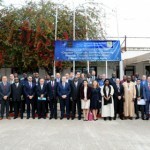 The 5th meeting of the Heads of Intelligence and Security Services (HISS) of the countries of the Sahelo-Saharan region took place in Ouagadougou, Burkina Faso, on 19 and 20 May 2014. The following countries participated in the meeting: Algeria, Burkina Faso, Chad, Cote d’Ivoire, Libya, Mali, Mauritania, Niger, Nigeria and Senegal. 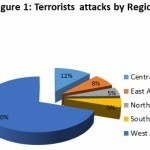 In addition to the Commission of the African Union (AU), the AU Mission for Mali and the Sahel (MISAHEL), the African Centre for the Study and Research on Terrorism (ACSRT), the Committee of the Intelligence and Security Services of Africa (CISSA), the Fusion and Liaison Unit (UFL), the Community of the Sahelo-Saharan States (CEN-SAD), the North African Regional Capability (NARC), as well as the United Nations Office for West Africa (UNOWA), also participated in the meeting. 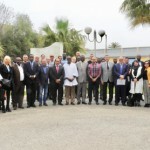 The meeting was held within the framework of the Nouakchott Process on the Enhancement of Security Cooperation and the Operationalization of the African Peace and Security Architecture (APSA) in the Sahelo-Saharan Region. It was a follow-up to the previous meetings of the HISS of the countries of the region, held respectively in Bamako, on 18 April 2013, in Abidjan, on 20 and 21 June 2013, in N’Djamena, on 10 September 2013, and in Niamey, on 17 and 18 February 2014. The meeting reviewed the evolution of the security situation in the region, based on the overall presentation made by the AU High Representative for Mali and the Sahel, former President Pierre Buyoya, as well as the contributions made by the ACSRT, CISSA, UFL and the countries of the region. Ambassador Francisco Madeira, AU Counter-Terrorism Cooperation Special Representative and Director of the African Centre for the Study and Research on Terrorism, (ACSRT), in his presentation, informed the participants of the capacity building activities carried out by the ACSRT especially the Workshop on strengthening border related counter-terrorism capacities in the Sahel through international databases and enhanced cooperation, coordination and information exchanges, held in Algiers, from 3 to 5 March 2014. the Ambassador also emphasized the progress made in the efforts concerning the elaboration of an African Arrest warrant, particularly the consultations held by ACSRT with the United Nations Office on Drugs and Crime (UNODC) and the European Union’s Judicial Cooperation Unit (Eurojust). Participants urged for the pursuit of these efforts to facilitate the finalization as early as possible of the elaboration process of the African Arrest Warrant. African heads of intelligence have agreed to immediately launch a regional training program for security officers. 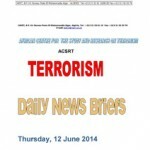 The training program will be led by the African Centre for the Study and Research on terrorism (ACSRT).